History: 1st year apprentice chef Misto Restaurant Kent St Sydney. 2nd year apprentice Darling Mills Restaurant Glebe Sydney. 3rd year Martini Restaurant MLC centre Sydney. 4th year Browns bar & restaurant QVB Sydney. From there I opened the Queens Victoria Tea Rooms as 2nd chef, and then opened Bar Europa on Elizabeth St Sydney as the head chef, which was my first head chef job. From there I returned to Browns Bar & Restaurant as head chef (all 3 of these venues were operated by the same company). 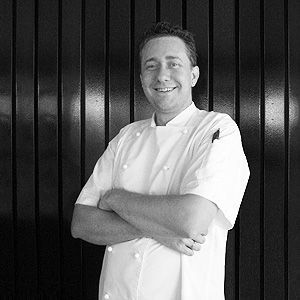 From there I moved out to Norwest Business Park and operated 2 venues there: Daniel’s as sous chef & Albert’s Lakeside as head chef. Next venue was located at Bluey’s Beach just below Forster on the mid north coast of NSW; the venue was called Kingfisher at Bluey’s Retreat and while i was there we won the best café/restaurant of the mid north coast from Restaurant & Catering - I was cheffing there for 3 years. I worked there for 3 years and have recently moved to Blue Martini in Drummoyne. Yes, my family is very food focused and I have many relatives working in hospitality or in food services, and my earliest memories always seem to involve food; my grand father is a passionate cook & I received a lot of my inspiration for food from him. How would you define your style? Modern European. Just chefs in general. They are a very passionate bunch of people, and they never stop talking about food or techniques. I do look up to the big European chefs as well – including Ferran Adria, Rene Redzepi & Alain Ducasse. Most “eyebrow raising” menu item? My Chocolate Garden - it is a dessert that replicates a small garden patch with soil, herbs, flowers, chocolate twigs & berries. Signature Dish: Pan seared Canadian sea scallops with Granny Smith apples, celeriac Remoulade, apple balsamic & micro rocket.